In a humming factory in Foshan, Guangdong province, a machine is busy tailoring fabrics to custom designs. Within 18 seconds, a pair of jeans is done, outperforming humans who would take 30 minutes to an hour to do the same job. The “smart tailor”, as the machine is known, is part of a broad effort by Foshan Shunde Everstar Clothing Co to leverage cutting-edge technologies and revolutionize its assembly lines. Five years ago, when many Guangdong clothing factories suffered from falling overseas orders and rising labor costs, Fan Youbin, president of Shunde Everstar, decided to upgrade the company using the internet and automation. After pouring 40 million yuan ($6 million) into inventing the smart tailor, the company also launched an online platform where consumers can design their own clothes and try them on in a virtual fitting room. “Within three days of placing an order, our customers can receive their clothes,” Fan said, adding that the shift to smart manufacturing makes it possible to produce a profit from small orders. Shunde Everstar’s story of increasing automation is playing out across China in thousands of factories, which purchase a quarter of the industrial robots sold globally. The trend will be discussed in detail at the ongoing 2016 Summer Davos Forum in Tianjin, as Chinese firms scramble to embrace robots and big-data technology to boost efficiency and cut assembly line costs. 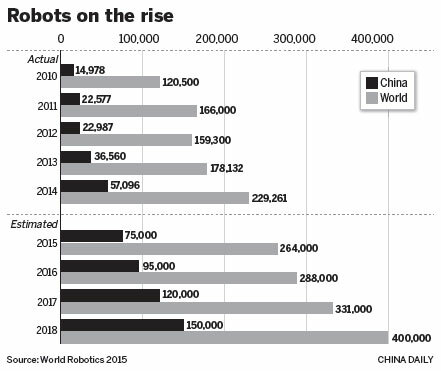 Data from the International Federation of Robotics show that between 2010 and 2014 the supply of industrial robots in China increased by about 40 percent per year on average. Still, for every 10,000 employees, there are only 36 robots in China, compared with 478 in South Korea, 292 in Germany and 164 in the United States in 2014. “The number will rise more sharply over the next five years, partly stimulated by strong policy support,” said Hao Yucheng, deputy director of the China Robot Industry Alliance. The robot industry is highlighted in the country’s 13th Five-Year Plan (2016-20), which guides national economic development for the coming half-decade. China also plans to triple its annual production of industrial robots to 100,000 in five years to help promote high-end manufacturing. Midea Group, a leading maker of home appliances in China, is relying on robotic “workers” to churn out high-quality air conditioners. In one of its factories in Guangzhou, Guangdong province, robots are performing a string of labor-intensive tasks, such as packaging and feeding parts, along with delicate and flexible work like applying bar codes. By the end of 2015, Midea had installed more than 560 robots in air conditioner plants, up from only 50 in 2011. During the same period, the workforce was trimmed by more than 22,000. “We plan to spend 4 billion yuan on cranking up automation in the next five years,” said Wu Wenxin, Midea’s vice-president. By 2018, the number of robots will surge to 1,500, and half of the company’s manufacturing will be automated. Earlier this month, the company said it was bidding for more than a 30 percent share of German industrial robot giant Kuka AG, highlighting Chinese enterprises’ eagerness to embrace the new technology. Local governments are also acting swiftly. Shenyang, Jilin province, for instance, proposed in May to set up a 20 billion yuan industry fund with the aim of cultivating stronger homegrown robot makers and meeting the growing demand from manufacturing companies like Midea. “Smart manufacturing is the only way to China’s future growth. It is not something you can choose to follow or not. It is an inevitable trend,” Wu said. Now look again. Dressed in a traditional white Chinese robe, the speaker, Jiajia, is in fact a robot, but one so realistic it’s hard to tell the difference at first glance. She has red lips, shining black eyes and can be taught to interact with people in both conversation and movement. This humanoid is part of China’s broad effort to develop service robots, as the world’s second-largest economy is seeing a surge in demand for them in the healthcare, education and entertainment sectors. With an aging population and increasing labor shortages, China plans to sell more than 30 billion yuan ($4.6 billion) worth of service robots by 2020. Jiajia was developed by a research team at University of Science and Technology of China in Hefei, Anhui province. After being unveiled in April, she quickly earned the nickname “robot goddess” for her combination of physical beauty and deep learning ability. Jiajia can naturally move her eyeballs and show micro expressions on her face. More important, her speech is in sync with her lip movements. Chen Xiaoping, the director of the research team, said Jiajia marks a breakthrough for China’s service-robot industry by adding a new dimension to artificial intelligence. “Most domestic enterprises just focus on voice recognition, but we not only enable robots to move but to match movements to speech,” Chen told China Daily in a telephone interview. He said Jiajia can show micro expressions appropriate to what she says. When Jiajia says, “I am happy”, she will smile, just as humans might do. “The next step is to teach Jiajia to recognize others’ facial expressions and make appropriate responses,” he said. It took the team three years to complete the robot. Among other applications, Chen believes Jiajia will be a good assistant for the elderly. “Many seniors travel to southern China for health reasons. But most of these 80-year-olds are taken care of by 60-year-olds, because of a shortage of young people,” Chen said. USTC researchers also developed a domestic service robot known as Kejia, which prevailed at the RoboCup championship in 2014. “Unlike the industrial-robot industry, which is dominated by four foreign companies, the service robot market is still in its infancy,” said Luo Jun, chief executive officer of the International Robotics and Intelligent Equipment Industry Alliance, a Beijing-based industry association. “Domestic companies can thrive if they manage to make breakthroughs in artificial intelligence,” Luo said.